There is an ongoing sale on gaming laptops and accessories and the online retailers are offering all gaming related gadgets at a lowered price. 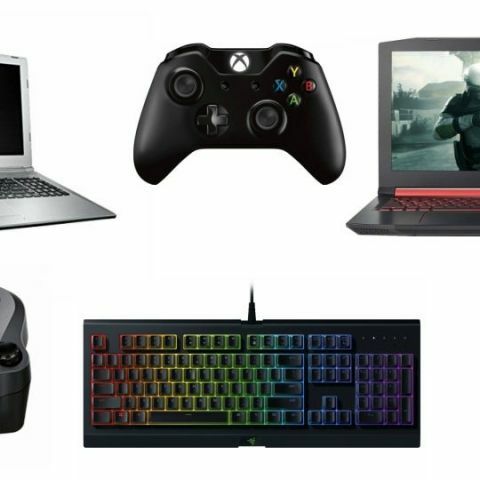 Most of the online retailers are offering great deals on gaming laptops, accessories and consoles. We have rounded up the best ones here. Let's take a look. The Acer laptop is powered by the 7th Gen Intel Core i5 processor with 8GB DDR4 RAM and comes with 2GB Nvidia GTX 940MX GDDR5. It features a 15.6-inch display and connectivity options include two USB 2.0, one USB 3.0 and one USB Type C port. You can buy it here. The MSI laptop is powered by the 7th Generation Intel Core i7-7700HQ processor with 8GB DDR4 RAM. It features a 15.6-inch display and comes with 2GB Nvidia Geforce MX150 GPU. You can buy it here. The simulating racing gear shifter by Logitech aims at providing near realistic racing experience and features six gear shifter. It is compatible with PS4, Xbox One, Windows 8, 8.1 and Windows 7 as well. You can buy it here. The wireless Microsoft Xbox controller can be paired with a PC or laptop and is supported by wide range of games as well. It boasts of up to 30m range and also has a headphone jack. You can buy it here. The Amkette Evo Pro 2 gamepad can be connected to a smartphone or a tablet. There is also an app using which one can connect to it. It supports most of the games and you can buy it here. Razer’s entry-level gaming keyboard, the Cynosa Chroma comes with Individually Backlit Keys with 16.8 million customizable color options and features a standard wired USB connection. It also comes with ten Key Anti-Ghosting which the company says can execute up to ten commands at the same time. You can buy the keyboard here. The Redgear gaming set features a membrane keyboard with three LED backlights, a Redgear 3200DPI manta gaming mouse, the company’s speed gaming mousepad and a pair of gaming headphones with mic. You can buy it here. The Razer Deathadder gaming mouse features a wired interface and has a maximum acceleration of 50G. It sports a 1000Hz polling range and a 6,400 DPI resolution, which is well suited for FPS games. You can buy it here.